Family Blessed, A / Rotthoff, Dan / Paperback / LSI - TEACH Services, Inc.
Saddle up and get ready for an exciting ride through the life of Dan Rotthoff. From his birthplace in Aspinwall, Pennsylvania, to his current residence in Ritter, Oregon, Dan's life has been full of hard work and lots of adventure. 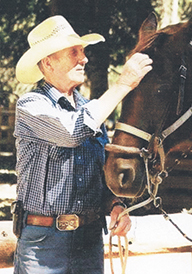 Sawmill owner, soldier, farmer, rancher, traveling salesman, pilot, cowboy, and lay pastor are just some of the occupations that he has worked at through nine decades of life. Husband of one and father of three, Dan did whatever it took to provide for his family and to raise them in the nurture and admonition of the Lord. He and his beloved Margie, aka Nana, worked side-by-side through good times and adversity, always trying to follow the Lord's leading. Jobs took them from Pennsylvania to California and then to Idaho. As owners of a cattle ranch in Garden Valley, Idaho for nearly forty years, Dan and Margie gifted the ranch with its home and barns to an organization known as Project Patch, that provides a new start for troubled teenagers. This gift was made in 1989-1990. When Dan lost his precious Margie to the ravages of illness, he could have settled into a quiet retirement. Instead, he answered the call to be a volunteer lay pastor in the remote Alaskan village of Togiak, where he served for four years in his mid-eighties. Join Dan as he recounts all the ways the Lord has led and protected him and his family through the years—through close calls on land and in the air, long treks through the snowy Idaho mountains on skis, cattle drives, and financial gain … and loss. Dan Rotthoff was born in Aspinwall, Pennsylvania and currently lives in Ritter, Oregon. He has plied many trades through the years, but his most fulfilling one was that of volunteer lay pastor in Togiak, Alaska. He attends the Long Creek, Oregon, Seventh-day Adventist Church, where he formerly lay-pastored, along with the John Day and Dayville churches, all done when he was in his eighties. John 17 is his favorite Bible passage, and he loves to ride horseback in the central Idaho mountains. He is happy just to wake up each morning. He longs to see his entire family committed to and active in the Lord’s work.